The title of this statue is TORMENT IN STONE. 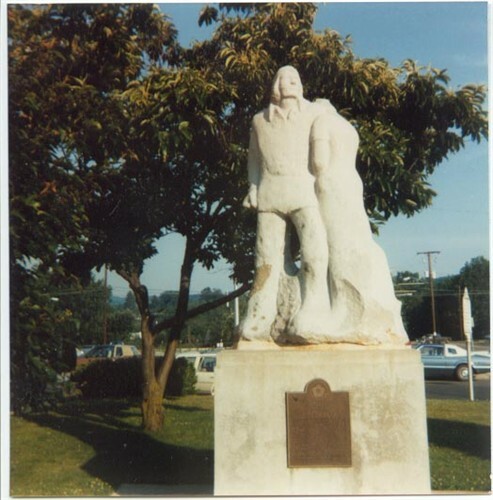 The statue is located on the lawn of the Court House in Princeton, Mercer County West Virginia. It is the depiction of two parents, Mitchell and Phoebe Belcher Clay. It recalls the pain, agony and loss their family experienced in 1783. This is their story. The Clay family of Virginia and Kentucky emigrated to America and settled in Virginia before the Revolutionary War. 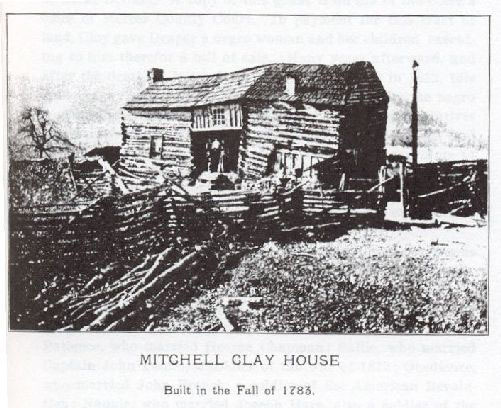 The Clays settled in Franklin County and were the ancestors of Mitchell Clay who came to Clover Bottom on Bluestone Creek in 1775. In 1760 Mitchell married Phoebe Belcher in Franklin County VA. In April of 1774, Dunmore, the Royal Governor of Virginia granted Mitchell Clay 800 acres of land on Bluestone Creek, Clover Bottoms in what was then Fincastle County, VA and Mercer County, VA. The grant required him to “render so much ground rent to the King of Great Britian”. This grant is on file in the Clerk’s Office of Mercer County Court. Over the years, Phoebe and Mitchell had fourteen children — Seven sons and seven daughters. Before the fall harvest in late-summer 1781, Mitchell and a neighbor went to buy supplies for the fall hunt. He left his sons to look after the family. Charles and Mitchell Jr. decided to go hunting, leaving brothers Bartley and Ezekiel to fence the wheat stacks so the livestock could be turned out into the fields for late pasture. Phoebe began the day’s activities sending Tabitha down to the river with the older children to wash clothes. Rebecca was in the house and Obedience (Jack’s ancestor)was in the yard watching the younger children and helping her mother. Watching all of this was an Indian scout. He had been watching for several days from the top of a nearby ridge, across the river. There were two parties of Indians looking for horses to steal. The scout knew Mitchell was gone and that four of the boys were off working or hunting. The Indian wanted a scalp or hostage. Or both. At the sound of a shot, Tabitha, down at the stream, ran with the children up towards the house. They found Ezekiel surrounded by Indians. Tabitha fought off the attack while the other children ran up the hill. A neighbor happened to be in the yard talking with Phoebe and managed to hold the Indians off until Phoebe and some of the children could get into the house. The Indians had Ezekiel, Bartley and Tabitha. The neighbor drew the Indians away and Phoebe and her family were able to get to neighbor James Bailey’s house. A pursuit party was sent after the Indians. At this point, Mitchell Clay and his neighbor returned home to find the bodies of his two children and the rest of his family gone. Shortly after that, the older boys returned from hunting. Praying that the family had escaped to the settlement the men headed that way. They met up with the pursuit party and upon hearing the rest of the family was safe, they joined the group. They followed one group of Indians in hope of ransoming Ezekiel. When they reached the Indian town of Chillicothe, Ohio, they found Ezekiel dead, still tied to a burning stake. Mitchell retrieved his son’s body and returned home. He buried Ezekiel next to his brother and sister. Phoebe would not return to the homestead. They re-moved to New River and purchased land opposite the Pearisburg Station on N & W Ry. County’s railway line. He built a house there in 1783. It is still standing . Obedience Clay would marry John French. Their descendant, Callie Mae French would marry Luther Fuller and have a daughter named Bonnie. Bonnie was Jack’s mother.